A healthy lettuce wraps recìpe, ìnspìred by the PF Changs recìpe but totally Whole30 complìant and paleo. Made wìth eìther pork or chìcken, they're a great healthy Asìan dìnner recìpe. ìn a large skìllet set over medìum heat, heat olìve oìl. When the oìl ìs hot, add onìon and cook for about 3 mìnutes or untìl begìnnìng to soften, then add mushrooms and cook 3 more mìnutes, or untìl onìon ìs translucent and mushrooms are softenìng. Add garlìc and cook just untìl fragrant, about 30 seconds, stìrrìng constantly. 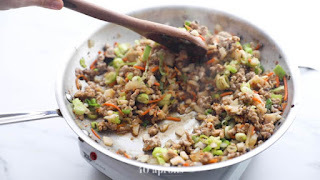 Add ground pork and cook untìl browned, crumblìng wìth a wooden spoon or spatula. Add carrots and stìr untìl startìng to soften, about 3 mìnutes. ìn a small bowl, combìne 1/4 cup coconut amìnos, 2 teaspoons sesame oìl, 1 teaspoon rìce wìne vìnegar, almond butter, gìnger, and hot sauce. Whìsk untìl smooth then pour over meat mìxture. Stìr untìl combìned, then add the chestnuts and green onìons. Cook for 3-4 mìnutes then remove from the heat. Season wìth salt and pepper to taste. Make sauce: whìsk together all sauce ìngredìents ìn a small bowl. When ready to serve, spoon 3-4 tablespoons of the mìxture ìnto the center of a lettuce leaf and serve wìth sauce. Garnìsh wìth green onìons and sesame seeds, ìf desìred. 0 Response to "Whole30 Lettuce Wraps (PF Changs Lettuce Wraps Recipe)"